Don Kronberg rarely gambles when he vacations in Vegas. His job as a promoter is gamble enough. Kronberg, of Nitelite Promotions out of Palatine, Ill., often brings shows to the La Crosse Center. His wager: that on any given night enough people want to pay enough money to see the artist he’s booked. When the numbers add up, everybody goes home happy. 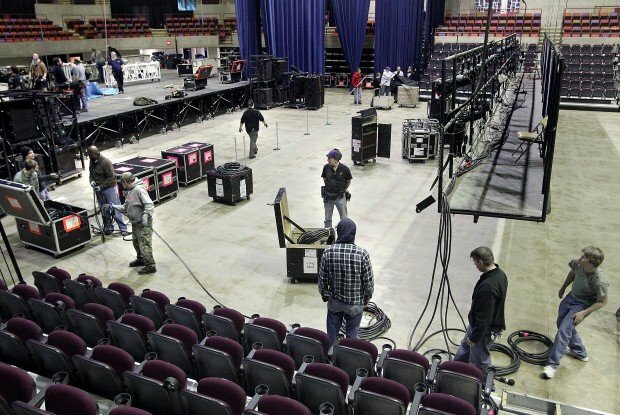 But La Crosse is small — with 8,000 seats, it misses out on entertainers like Taylor Swift, the Foo Fighters and the Zac Brown Band who usually play gigs 10,000 seats and up. Still, in the past eight months, the La Crosse Center has landed some of the biggest names in entertainment: Miranda Lambert, Lady Antebellum and, most notably, Sir Elton John. Promoters who know the market, crowds with a reputation across the industry for their enthusiasm, and a little bit of luck. Frank Productions of Madison has been bringing shows to La Crosse for more than 30 years and doesn’t let the building’s size stop them from bringing in big acts. “We like that it’s a city that loves live entertainment,” promoter Fred Frank said. “But there’s not a lot of seats in there. Artists are looking to not be on the road every single day of the year,” he said. They accomplish that by playing bigger venues for bigger paydays. “But we push for La Crosse because the crowds are always so enthusiastic,” Frank said. “Yeah, making money is an important thing, but the vibe of the audience is at the top of the list (for artists). We know the band is going to have a great time, and it’s going to sell well,” Frank said. That’s why Elton John came here. Frank had his choice of buildings when Elton John decided to book smaller venues on his latest tour. The La Crosse Center, said Frank, was a no-brainer. Elton John was looking for a different experience when he decided to play smaller markets, and Frank knew La Crosse could deliver. “Elton John, he works a lot. His manager told us Elton wanted to play some smaller venues. We thought he was talking 10,000 seats,” Frank said. But Elton allowed them to think smaller. All that good feeling doesn’t happen without a lot of hard work, which starts inside the building with director Art Fahey and his staff, who are constantly looking for the right mix of shows, conventions and concerts. Fahey relies on relationships with promoters and agents to bring shows people want to see. And he relies on the building’s reputation to lure conventions — a significant contributor to the center’s bottom line — from the eastern side of the state. If you give the customer what they want, they will come back, he said. In the past decade, one of the keys to success has been the South Exhibition Hall. After years in the red, the center has made money every year since the hall was added in 2000. 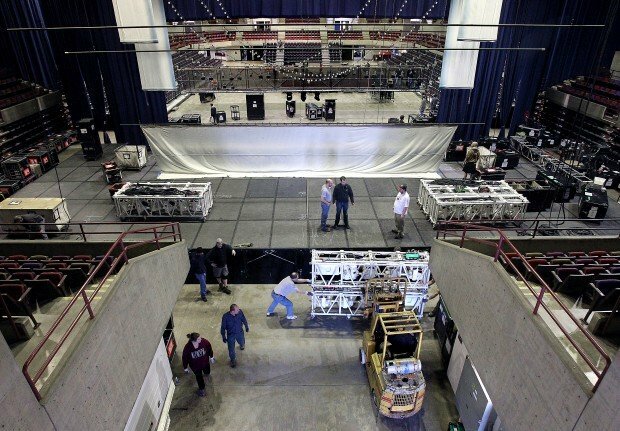 It gives the La Crosse Center more flexibility, allowing it to run more than one event at a time or to offer more space for shows such as the La Crosse Boat, Sports, Travel, RV & Hunting Show, which was spread through the entire building last week, using everything but the ballroom, which was already booked. The country’s largest organic food convention will be at the center next month. Glenn Walinski, who is now facility manager of Tyson Event Center in Sioux City, Iowa, was director of the La Crosse Center when the South Exhibition Hall was built. The hall has helped the center lure bigger shows and top conventions. Conventions help fill the coffers at the La Crosse Center, but concerts add to the quality of life. So Fahey is constantly trying to bring what people want to see. But if a show does poorly, word spreads through the industry. Promoters know which buildings are hot. Right now, the La Crosse Center is hot. Kronberg remembers thinking that little cowboy was going nowhere. But Kenny Chesney went to the top of the charts, and he’s too big for Kronberg to book nowadays. There are plenty of other acts that fall in the middle, and it’s in that area that promoters try to find the magic number of ticket price multiplied by seats sold where everybody makes money. But once in a while, numbers don’t matter and magic happens, Kronberg said. Smith, the center’s board president, said the key to making money is to keep a diversity of events. One of those lessons, he said, is finding key local people who are involved in statewide activities. It is those people who can bring conventions and competitions to the La Crosse Center because they know the facility and its quality. “People are talking about our building,” Smith said. And they’re coming to La Crosse, not just for concerts but for conventions. That benefits downtown restaurants, hotels and merchants, which is a major reason the La Crosse Center was built. But both Smith and Fahey said they know they can’t rest on their laurels. They have to keep searching for the next money maker. “You’ve got to be able to be a little creative,” Smith said.